1. Oriental Beauty (fully oxidized): honey flavored, sweet and dry. light wheat notes, but mostly a strong honeyed flavor. Reminded us of darjeeling. 2. 10y aged Taiwanese oolong: quite sweet flavored and salivatory-making. Very smooth and drinkable, though a little too simple and un-nuanced for my tastes. 3. 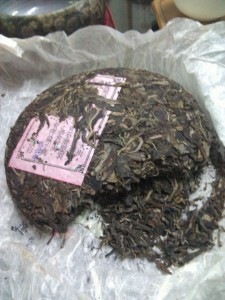 2009 loose-leaf black puerh (puerh leaves, but fully oxidized like a black tea). Interesting! 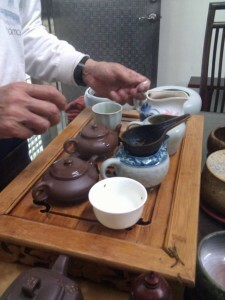 The dry and wet leaves smell like a black tea, but the liquor smells and drinks like a puerh. Fruit notes. 4-8: A series of plantation and wild puerhs, drunk in progression from younger to older (2009 down to 2005). These ran the gamut of smokey to mild, sweet to bitter (though none of that bile lincong, thank God). Part of the motivation for this series was to differentiate between plantation and wild tree, and also the effects of aging (however, I felt there was enough variation between the individual teas of each type that they outweighed any inter-type variation we might have seen). 9-11: Older puerhs (2001, 1994, 1988 in succession). The 2001 tiebing puerh, wild tree, from a mountain (near yiwu) I didn’t get the name of. Smooth and bitter (in a good way). It was a nice break from the younger puerhs we’d been having. The biggest improvement was in the mouthfeel rather than the taste (full and thick, whereas the younger stuff had been closer to water). The 1994 had an improved mouthfeel, and a good earthy flavor. The 1988 (Qiwu) continued this trend with a sweeter, smoother earthiness. It was slightly faded tasting. 12. 1975 7572 Orchid-scent: Sweet and full, but in an indirect way. Subtle on the tongue. A sweet huigan (most of the character of this tea doesn’t come in the taste, but in the aftertaste, which I absolutely love). The mouthfeel is thick and smooth, with a menthol coolness after swallowing. Brimming with qi. Even more depth of character. Deep earthiness and menthol. Louder and direct, while the 7572 was more indirect (though just as strong, in its own right). While this is a wonderful, wonderful tea (and the “better” one, if you count by price alone), the subtlety of the 7572 was by far my favorite of the day. (Sorry, my last two teas I was too busy to enjoying to take any real notes…). * My uncle’s Chinese is heavily-Taiwanese-accented, so it’s sometimes hard to follow. He doesn’t say lu cha but li cha. It’s not guoyu he speaks, but goyi. * There’s a distinction between hand-picked and machine-clipped when harvesting leaves, and you can tell pretty easily by the edge of the leaf’s stem. Not sure how much effect this has on taste (other than the manually-harvested being perhaps of better quality). 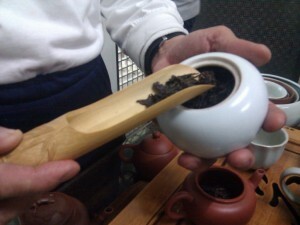 * The puerh bubble started peaking in earnest in 2007. So teas especially in 2007 (and, to a lesser extend, from following years), are overharvested (and some fake). It you can (and if you can afford it) it’s best to buy teas before then. * Ugh. Was up until 4am the night after, from all the caffeine. But very, very worth it. Comments closed — Trackbacks closed RSS 2.0 feed for these comments This entry (permalink) was posted on Wednesday, December 29, 2010, at 07:09 by mote. 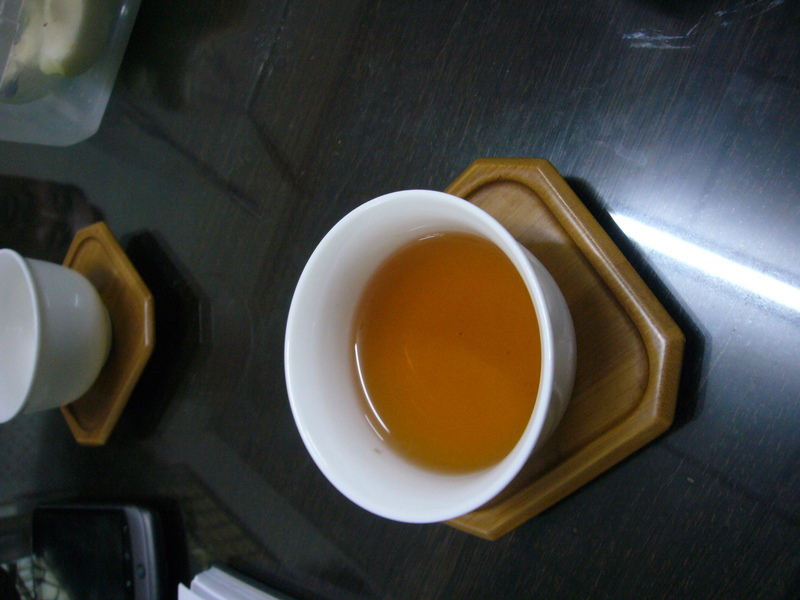 Filed in General, tea, world and tagged taiwan, tea.